The world of tech is rather like the world of pop: one minute you're the next Taylor Swift; the next, you're even less popular than Limp Bizkit. This week we discovered the futuristic facial tech that's fallen out of favour, saw the most unexpected comeback by one of tech's biggest names, wondered if Valve can ever top its ten-year-old hit Half-Life 2 and found the tech founder who could talk the hind legs off a Bono. 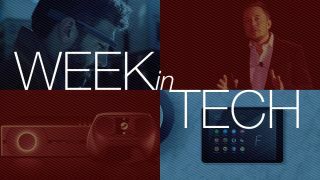 It's a poptastic Week in Tech! Remember Nokia, the big name in phones for the last billion years? Well, now it's back! Back! BACK! - er, sort of. The Nokia N1 tablet looks like an iPad mini, runs Android and isn't actually made by Nokia. It's the first fruit of a licensing deal that lets Foxconn use the brand in exchange for big piles of money, and while Nokia did contribute the design it has no intention of making or marketing its own kit any more. It's starting to feel a lot like Christmas, and Google Glass is starting to look a lot like a turkey. The launch of the consumer edition appears to have been pushed back to 2015, big name firms such as Twitter have started to back away and even Google's own Sergei Brin has been spotted without his facial furniture. Hugh Langley doesn't have high hopes for its future, and suspects it's created its own killers: as he says, "Glass's biggest problem might be that its very existence has led to the creation of its biggest rivals" in the form of VR headsets. Unlike them, "Glass isn't exciting enough to be a mass-market device." Smartphone firm Jolla has started an Indiegogo campaign to build the world's first crowdsourced tablet, and it surpassed its fundraising goal in just a few hours. Jolla doesn't just want your money, though. It wants your ideas too: it wants to know what features people really want to see in their tablets, and pledging money gives you a voice in that as well as a nice discount. As many of us expected, Apple has decided to roll out the Beats Music service to every iOS user - but it won't be free. It could arrive as early as March, and while it'll still cost money it may be the beginning of a streaming price war: Apple has reportedly been courting record labels in an attempt to halve the service's price. Valve won't be at CES 2015, we've discovered - but it will be at GDC 2015, and it's planning a really big push in an attempt to re-ignite the fire under its home console hardware. The devices are still in the pipeline - Alienware ones should begin shipping within minutes of you receiving this - but it's safe to say the initial enthusiasm and hype has waned somewhat in recent months. Despite the best efforts of rival payment services and huffy retailers, Apple's Apple Pay system appears to be doing very well indeed: McDonalds reports that 50% of its contactless payments are currently Apple-powered, while Whole Foods says it's processed 150,000 Apple Pay transactions in the US so far. It'll be interesting to see if it can repeat its success in the UK, where PayWave contactless bank cards are already widespread: while America leads the world in many things, it's only just coming over to the idea of Chip and PIN technology so it's ripe for a bit of Apple magic. The UK payments market may be a tougher nut to crack. Tesla boss Elon Musk is one of the most consistently interesting people in tech, so whenever he makes predictions it's worth paying attention. So it's a shame he's running about the place with a black cape on shouting "Doom! DOOOOOOOOM!" and predicting the end of humanity. He's suggested that artificial intelligence will wipe us out before, but now he's put a date on it: he reckons we'll be in deep doo-doo "in the five year timeframe, 10 years at most." Have a great week while you still can!